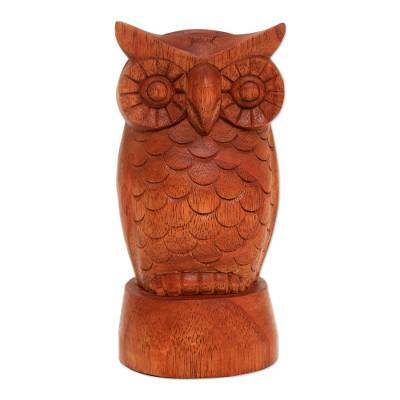 Hand-carved of jempinis wood in the shape of an eagle owl atop its roost, this charming and whimsical eyeglasses holder makes the perfect addition to your home decor. Bali's Yudi Suardi designs the holder, given a natural finish. Your eyeglasses fit perfectly atop the owl's beak. 17 cm H x 8 cm Diam. 6.75" H x 3.1" Diam. "Benalu was not used in sculptures but only as firewood. But I saw the enormous potential in this wood because of its unique and fascinating shapes — no two pieces are ever identical." "I agree with Albert Einstein. He said, 'Imagination is more important that knowledge.' This inspires me so much that I'm always thinking about what new things I can do. "My father is a wood sculptor. He taught me how to choose good woods, carve and finish them. "Sadly, the young generation today rarely wants to carry on with Bali's sculpture traditions. This is why I was especially interested in learning. "Yes, we do some traditional Balinese carvings and most are still created manually with a bit of help from hand tools. Our materials are obtained from several areas in Bali. "The lives of Balinese people can be hectic with religious ceremonies throughout the year. So many people don't have enough time to take an office job. Wood carving can provide an income with flexible working hours and can be done at home. "I use woods like suar, jempinis, and benalu wood, which can be obtained from local timber traders. Benalu was not used in sculptures but only as firewood. But I saw the enormous potential in this wood because of its unique and fascinating shapes — no two pieces are ever identical. So I incorporate it into my work. "My childhood was a happy time for me. I have a family who always supported me. My father was a sculptor and taught me to craft things with my own hands, so I became a man full of curiosity about how to make new things. My mother is a religious teacher and taught me how to behave toward people and nature. "In school, I majored in mathematics education. Once when I was on my way to teach in a classroom, my pants suddenly ripped from top to bottom. I panicked and wanted to go home to change but class was starting in five minutes. To go home, I'd have to go through the senior teachers and students on campus. After quickly considering it all, I used a stapler to hold my pants together but it was the most embarrassing experience in my life!" My friends and family describe me as a person with lots of ideas. I work very hard. I always want something new in my life but I don't like to make quick decisions. I have to think before deciding. "In the beginning when I first started carving wood, many people thought that a bachelor like me should be a government employee or an office worker. But I want to prove that I can succeed in my father's art. I want to change the public's view and show them that success is not only achieved with office work. 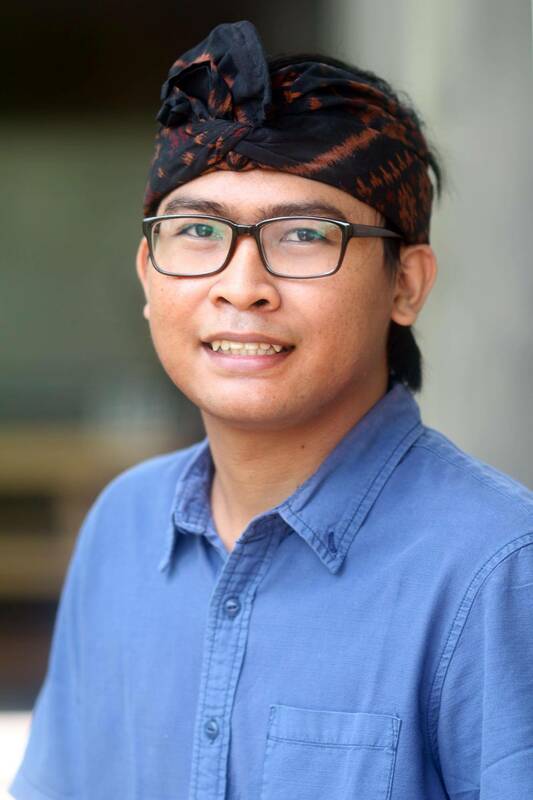 "Honestly, I am inspired by my surroundings, from animals and trees to our Balinese culture. My designs are different because I combine benalu wood with other shapes that make teach image unique. "I am not married yet. If in the future I have children, my hope is that my children learn to be responsible for themselves and I'd want them to continue with my workshop. I think they will because they'll be born and raised in Bali and will want to make sure their culture is preserved."